The flat political map represents one of many map types and styles available. Look at Region 3 from different perspectives. Classic beige color scheme of vintage antique maps enhanced by hill-shading. Region 3 highlighted by white color. Dark gray color scheme enhanced by hill-shading. Region 3 highlighted in white. Savanna green color scheme enhanced with shaded relief. Region 3 is highlighted by yellow color. Light grey color scheme enhanced with shaded relief. Region 3 highlighted in white. Political style for all areas outside of the borders of Region 3..
All areas outside of the borders of Region 3 cropped from the image. Physical style for all areas outside of the borders of Region 3. Political shades style for all areas outside of the borders of Region 3. Satellite style for all areas outside of the borders of Region 3. Shaded relief style for all areas outside of the borders of Region 3. All areas outside of the borders of Region 3 filled with a single color. All areas outside of the borders of Region 3 darkened. All areas outside of the borders of Region 3 desaturated to grayscale colors. All areas outside of the borders of Region 3 lightened. All areas outside of the borders of Region 3 partly desaturated to almost grayscale colors. Maphill is a collection of map images. This political map of Region 3 is one of them. Click on the Detailed button under the image to switch to a more detailed map. See Region 3 from a different angle. Sure, this political map is nice. But there is good chance you will like other map styles even more. Select another style in the above table and see Region 3 from a different view. If you like this Region 3, Tunisia map, please don't keep it to yourself. Give your friends a chance to see how the world converted to images looks like. 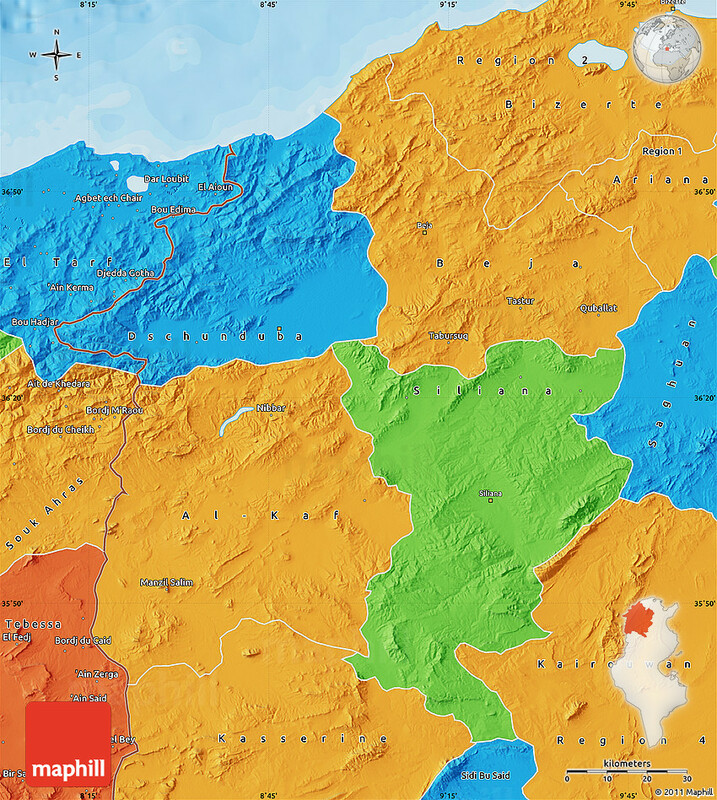 Use the buttons for Facebook, Twitter or Google+ to share this Region 3, Tunisia map. Maphill is the largest map gallery on the web. But the number of maps is certainly not the only reason to visit Maphill. Get free map of Region 3. Of course, there is. It has been said that Maphill maps are worth a thousand words. That's certainly true. But you can experience more when you visit Region 3. Region 3 has a lot to offer. It is not possible to capture all the beauty in the maps. Discounts for hotels in Region 3. If any of Maphill's maps inspire you to come to Region 3, we would like to offer you access to wide selection of hotels at low prices and with great customer service. Thanks to our partnership with Booking.com you can take advantage of large discounts for hotels in all major cities of Region 3. Compare hotel prices in Tunisia, book online and save money. See the full list of destinations in Region 3, browse destinations in Tunisia, Africa or choose from the below listed cities. Each map type offers different information and each map style is designed for a different purpose. Read about the styles and map projection used in the above map (Political Map of Region 3). The choice of color is not related to the characteristics of Region 3, colors are assigned to countries and regions randomly. The capital is marked with a black star inside a white circle. Squares and circles of various size indicate other major cities. A map projection is a way how to transform points on a Earth to points on a map. This map of Region 3 uses Plate Carree projection. The Plate Carree projection is a simple cylindrical projection originated in the ancient times. It has straight and equally spaced meridians and parallels that meet at right angles. All projections from a sphere to a plane are distorted. The drawback of the Plate Carree projection is that it doesn't make an attempt to compensate for these distortions. For the general view of Region 3, this is not a significant problem. The detailed maps use the Mercator projection which preserves the shape of small areas better. A list of the most popular locations in Tunisia as searched by our visitors. List of the locations in Tunisia that our users recently searched for. Do you think the maps are too beautiful not to be painted? No, this is not art. All 2D maps of Region 3 are created based on real Earth data. This is how the world looks like. The value of Maphill lies in the possibility to look at the same area from several perspectives. Maphill presents the map of Region 3 in a wide variety of map types and styles. Embed the above political map of Region 3 into your website. Enrich your blog with quality map graphics. Make the web a more beautiful place.